I was delighted to take on the challenge of writing a poem to help celebrate Diwali in Cupertino. 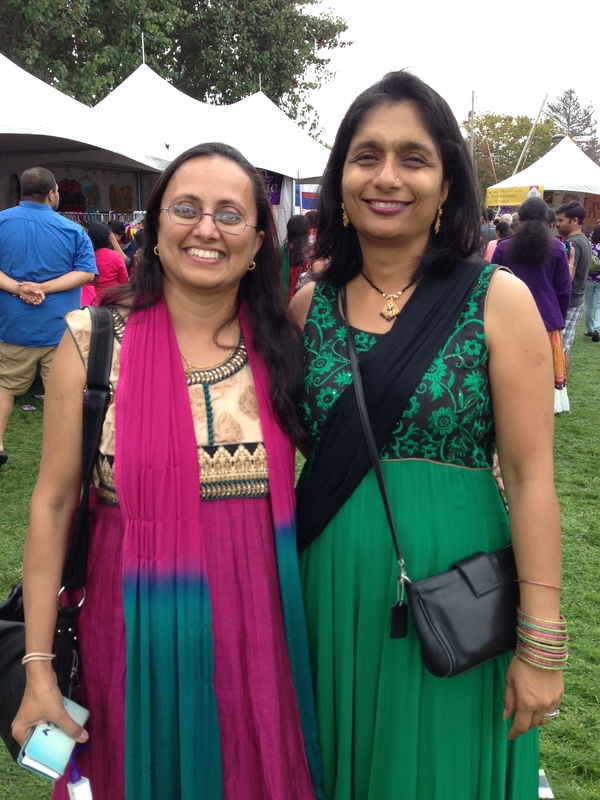 The Chamber of Commerce hosted a huge Diwali Festival in Cupertino’s Memorial Park on Saturday, October 17, and I read this poem at the festival. This poem is in the form of a pantoum. I like the form for holiday and seasonal poems, because it emphasizes repeated images and is well suited to themes of time and celebration– events like Diwali that come around year after year. In this poem I linked my memories of being a teenager in Cupertino (seeing the distinctive shape of lights from the quarry on the hillside while driving home in the dark) to current images of lights (the Mary Avenue pedestrian and bicycle bridge) that can be seen at night driving into Cupertino. Also, in October, you might see both Diwali and Halloween lights driving around your neighborhood. means that I am home. after late night family parties. the pedestrian & bicycle bridge glows! a shining gate into the city. where things are happening, in October. my children decorate this year. we find light in gloom and darkness. Light up our neighborhood streets! Janki and Jennifer, photo by Chwen Lim. Posing for the photographer — thank you to Chwen Lim for all the great shots. Here I am in the beautiful saree I was invited to wear for the occasion. I’m very grateful to Anjali Kausar and Janki Chokshi for all their friendly support! 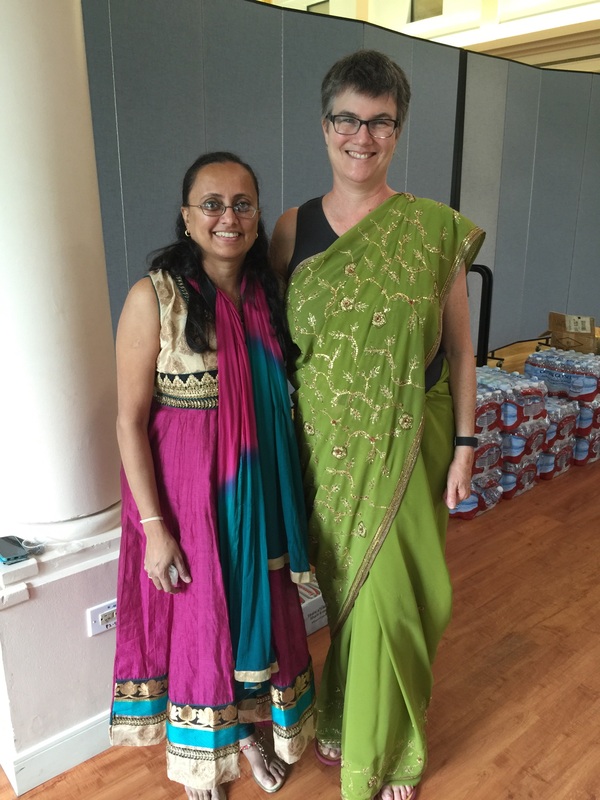 Janki pined me into the saree so I wouldn’t lose it. Many thanks also to Ann Stevenson of the Cupertino Library Commission for arranging this reading with Anajli (current CEO of the Chamber). 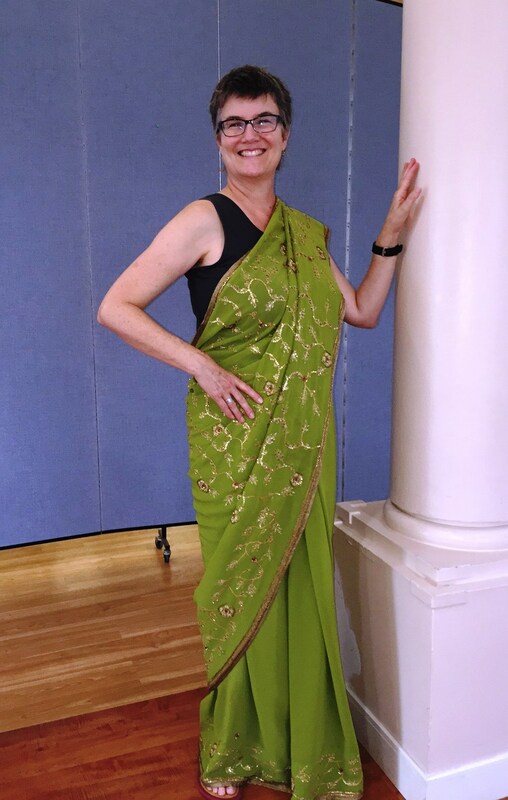 Thanks to Chwen Lim for the photos of the saree fitting. See more photos from the day here. I learned so much at the Diwali Festival. What a great outpouring of spirit and energy! Other pantoums can be found at the Poetry Foundation.